ActiveHistory.ca is on a two-week hiatus, but we’ll be back with new content in early September. During the hiatus, we’re featuring some of our favourite and most popular blog posts from this site over the past year. Thanks as always to our writers and readers! The following post was originally featured on April 29 2013. Things change – but rarely as fast and comprehensively as in the Canadian North. As late as the 1950s, most Indigenous people in the territorial and provincial North lived off the land, traveling seasonally to fish, hunt, trap and gather. The hand of Ottawa had just begun to be felt, gently in the case of Mother’s Allowance, firmly with removing children to residential schools, and more aggressively with the relocation of indigenous people to government-built reserve communities. A quarter of a century later, much had changed. Life on the land had declined, with snowmobiles largely replacing dog teams. Government was now ubiquitous, with the intrusions ranging from welfare dependency of many people to assimilationist school programs and the early stages of land claims negotiations. The socio-cultural consequences could be seen in the distressing spike in suicides, drinking, imprisonment, language loss and declining reliance on elders. If this was modernization, it had little to recommend it. Jump now to 2013. 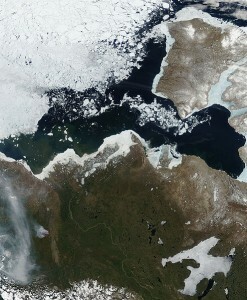 The North of the past is scarcely recognizable. Aboriginal land claims settlements, self-government, and the creation of Nunavut have transformed northern politics. Indigenous issues dominate northern agendas. Social problems persist, and poverty remains endemic, but a cultural renaissance is underway in many communities. Aboriginal people are more heavily involved in education, the wage economy and business ownership. Northern development corporations are the largest and most effective Indigenous-owned enterprises in history. While conditions are far from ideal, the tide appears to have turned in the direction desired by Indigenous peoples. Life has changed dramatically for non-Aboriginal northerners as well. Where the population was previously very transient, coming North as former Yukon Premier Tony Penikett used to say “to make a killing, not to make a living,” it is increasing stable. Whitehorse and Yellowknife are attractive small cities. New technologies, particularly the internet, tele-medicine and satellite communications, are improving the quality of life for everyone in the North. The mining economy has shifted from company towns to fly in-fly out camps, reducing the pressure on governments to service short-term resource towns. This remarkable transformation of the North has attracted relatively little attention from historians, save for an excellent group of environmental historians and a large group fascinated by the never-ending Arctic sovereignty debate. Northern historians have been blessed with a large number of Inuit, Metis and First Nations elders willing to share their understanding and knowledge, and have used these interviews to sharpen our understanding of the pre-World War II situation. To date, however, the post-1950s era has been left largely to political scientists and those studying public administration. Given the importance of the more contemporary transformations, the relative absence of historians’ voices has been unfortunate, given the discipline’s ability to connect contemporary and historical processes and to look for change and continuity in northern life. The problem goes deeper, however. The men and women who played pivotal roles in the post-war transitions of the North are now of advanced age. Very little has been done to record the oral histories of these vitally important political, business and community leaders. The story of Aboriginal land claims is about far more than the intense debates at the negotiating tables. The cultivation of Indigenous support, a process launched in earnest in the early 1960s, is not well captured in documentary record. Similarly, the manner in which federal and territorial politicians brought the non-Aboriginal community to the table is more complicated than generally assumed and can be appreciated only through extended discussions with active participants. The challenge is complicated by the unique nature of the modern political processes in the North. The reliance on consultants and advisors for much of the negotiating and development activity means that the archival collections that will be vital to the understanding of this era are already widely scattered, are not in government hands, and may well be improperly stored in the basements of family homes. If that were not bad enough, after the 1990s a great deal of political and administrative discussion occurred via email, cell phone and other technologically mediated means. The long and thoughtful letters once penned by government officials are largely historical anachronisms, replaced by technical “notes to the file” and official recordings of events and tactical positions. The rest of the historical record has been lost in what former National Archivist Ian Wilson has called a “digital dark hole.” What will likely been seen as one of the most critical eras in northern history is already seriously deficient in documentary terms, meaning that our ability to fully understand the transformations of the modern North has already been seriously compromised. The study of history is a reflective and contemplative exercise. For generations, historians avoided the study of the recent past – more than a few referred to such work as journalism – in favour of the study of more distant phenomena, where personal engagement and experience did not cloud the historians’ judgment. As the pace of human change picks up, however, transitions that scholars once charted over the generations now occur in a few years and in an interconnected fashion that would test the conceptual and methodological resolve of the most passionate devotee of the annales school. Historians are now largely self-marginalized in the debates about the Canadian North, with the aforementioned exceptions of environmental historians and sovereignty specialists. The problems are likely to become more acute in the coming years as the areas requiring historical context changes with increasingly regularity. Speedy history – the kind that has engulfed the North since World War II — requires speedy historians and even faster archivists. The latter are hamstrung by diminished budgets, growing demands on their time, and the increasing complexity of the historical record. If only a northern archive had a complete set of government emails since the advent of the service or copies of the thousands of telephone calls that, much more than the formal letter, capture the essence of public affairs in the North. The region also has a crying need for a massive oral history project, to capture the recollections of hundreds of northerners and southern government officials who negotiated and implemented the myriad agreements, settlements and processes that transformed governance and Aboriginal affairs in the North. The country will deeply regret its failure to record these personal histories, but there is little sign that a truly comprehensive effort will be made to tackle this assignment. Bill Gates once wrote that, in the age of the Internet, business has to operate at the speed of thought. Historians are spared such an unattainable target. Historians have to learn to work at the speed of change, not at the traditional leisurely pace of the discipline. To serve the region and the nation well, historians have to be active participants in the unfolding history of the Canadian North. Scholars have to learn to adjust their fields of study in tune with the changing public policy and social issues of the region if they are to remain truly relevant and important to the North. The speed of change presents formidable challenges for the historical profession, particularly since it is already known that the documentary record for this period will be scarce and stilted. Contrary to their nature, historians will have to be ever more active participants in collecting the historical material, as a small number of environmental researchers have started to do. To make sure that they and their successors have the right materials to work with, historians should create a region-wide movement to record and preserve the oral history of the post-war era, particularly focusing on the legal and political transitions. They have to become documentary ferrets, working to identify collections of key materials currently held in private hands or in digital formats and to bring them into the public domain. History, more than any other discipline, is not built for speed. Yet our times demand it – and not just in the North. The time has passed for lengthy evaluations of the work of the North West Mounted Police or the building of the Alaska Highway, two select topics dear to our hearts. It remains to be seen, however, if history and historians can adjust to history at the speed of change, in an environment of ever diminishing documentary records. Ken Coates is Canada Research Chair in Regional Innovation, Johnson-Shoyama Graduate School of Public Policy, University of Saskatchewan. Bill Morrison is Professor Emeritus of History, University of Northern British Columbia. They have written extensively on the history of Northern Canada, including The Alaska Highway in World War II, The Sinking of the Princess Sophia, and Land of Midnight Sun.